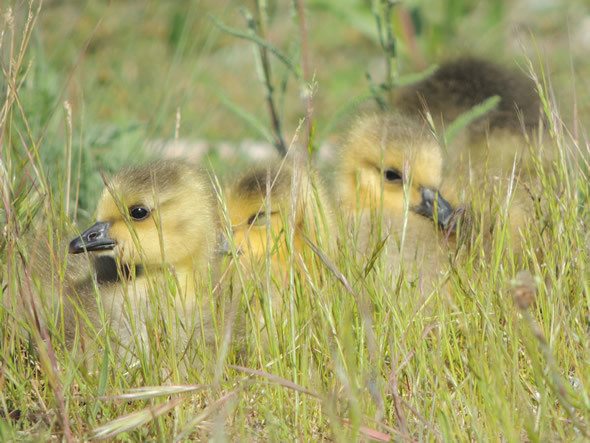 This month some young Canada Geese bid you a warm welcome. This month marks the 7th anniversary of Whispers! We are not sure where the time has gone or why it went by so quickly, but here we are, seven years later. Over the years we have presented hundreds of photographs, as well as lots of trivia, numerous tips and ideas and a whole bunch of jokes. 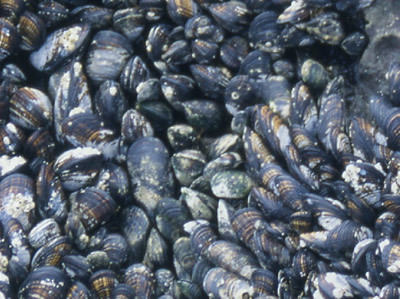 Which shellfish can survive in polluted water? The plants in this pictorial guide produce berries that are edible, but not always tasty! 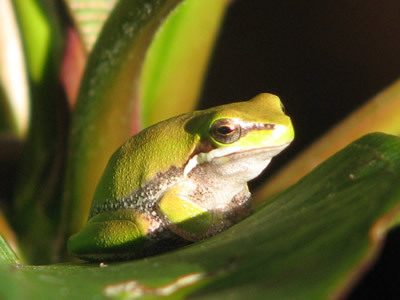 We received a wonderful response to our 6th annual Earth Day Photographic Extravaganza. This month we have another super selection of amazing nature photographs. 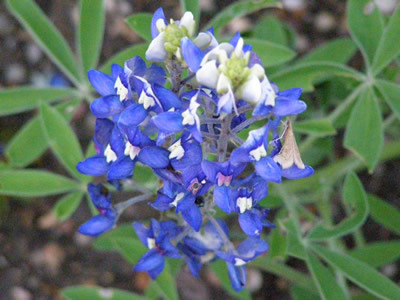 These Texas Bluebonnets come from Jane and Walt, Red Gate Farm, Texas. Jane and Walt also captured these delicate Turk's-caps, Malvaviscus drummondii. 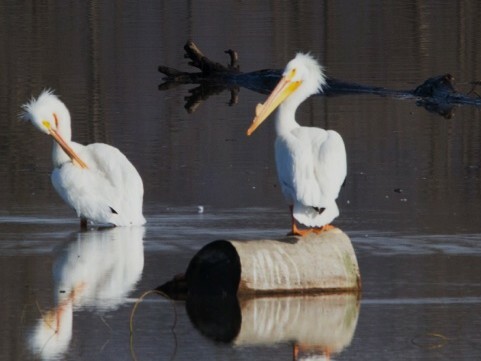 magnificent White Pelicans near the Mississippi River. comes to us from John Slaughter of Brisbane, Australia. 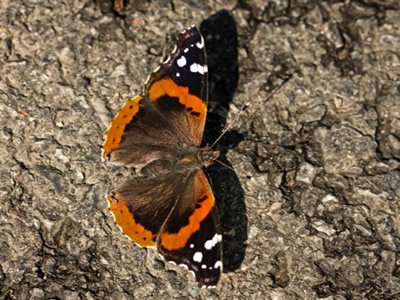 William Snyder also sent in this Red Admiral, Vanessa atalanta. contribute to this section. We really appreciate your wonderful pictures. Do you know what a universal veil is? 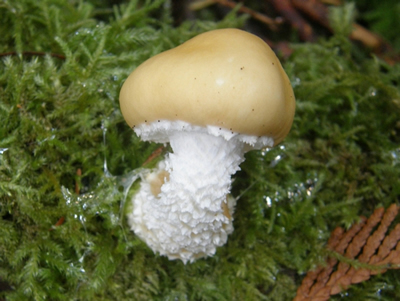 You will after visiting Understanding Mushrooms - an informative feature that'll explain the difference between stipes and gills as well as pores and spores in an effort to better appreciate all of those fungi. Hawaii where there's always so many fascinating plants. 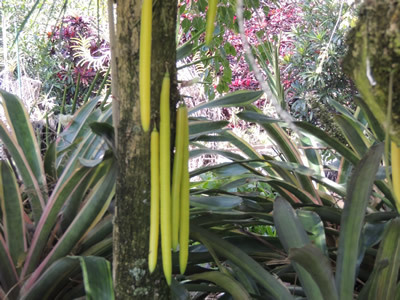 The Candle Tree, Parmentiera careifera, produces strange and unusual fruit that really do resemble candles hanging down from the branches. These long berries can grow up to 2 ft/60 cm long. 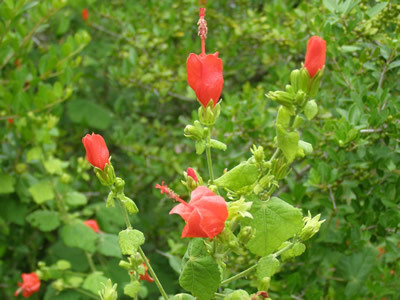 The Candle Tree is native to Panama. 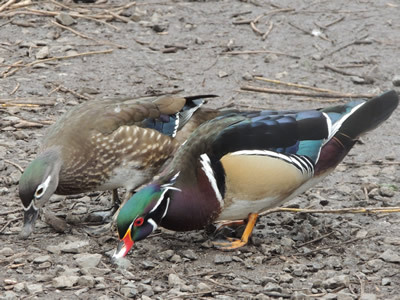 What do you think these two Wood Ducks are saying to each other? We'd love to receive your caption. As always, we've given you a couple of ideas to help get your brain working. Number one: "What exactly are we looking for again?" Number two: "Are we really supposed to eat this stuff? Yuck!" 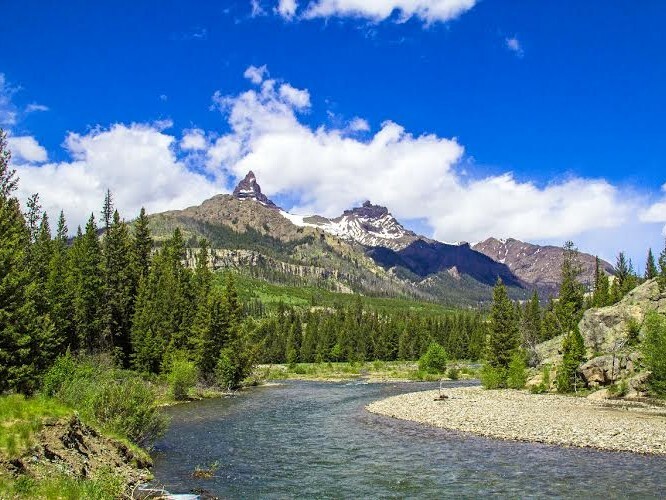 This month, Margaret Straley from Spencer, Roane County, West Virginia takes us to enjoy some beautiful scenery from along the Beartooth Scenic Highway in Montana and Wyoming. This is Pilot Peak, a towering pinnacle some 11,708 ft/3569 m high located northeast of Yellowstone National Park. Pointed Mariposa, Calochortus apiculatus, is a beautiful member of the Lily family of plants. 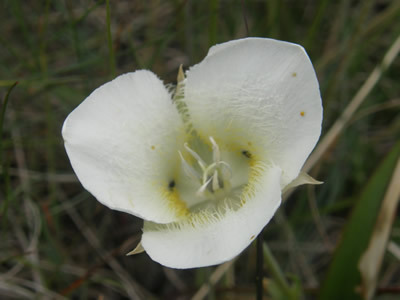 It has several other common names including Three-spot Mariposa Lily and Baker's Mariposa Lily. Therefore, the scientific name is extremely useful so that people know exactly which species of plant is being discussed. The genus name, Calochortus, comes from the Greek word kallos which means "beautiful grass." A young marmot had just passed his driving test and he asked his father if he could use the car. "You bring your grades up, study your Bible and get a haircut first," his father said to him. After a month the eager young marmot again asked his father if he could use the car. "I see you have brought you grades up, you've studied the Bible but you didn't get your haircut!" 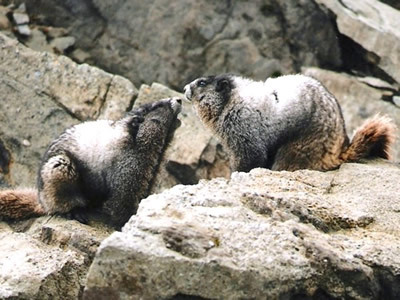 The young marmot replied, "I've been thinking about that. Samson had long hair, Moses had long hair, Noah had long hair and even Jesus had long hair." To this his father replied, "Yes, and they all walked everywhere they went." 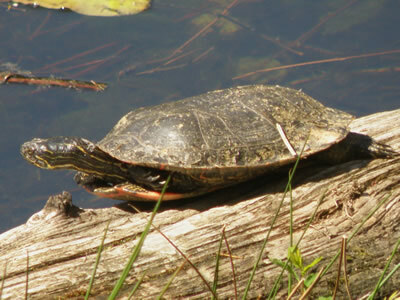 Many thanks to everyone who sent in photographs to celebrate Earth Day. We invite you to check out the great pictures by clicking here. it's a good idea to continue doing so through May. Parents with their new-born chicks will appreciate finding a little bit of extra food for them to feed their young ones. For many birds nesting season is in full swing. It's amazing what birds like to use to build their nests. 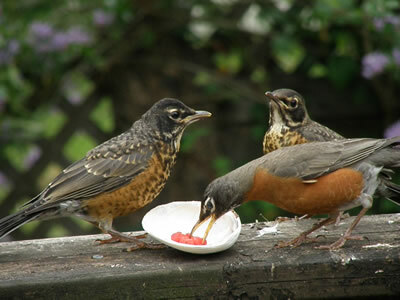 After a spring storm blew some lichen-laden branches off a tree, we secured them to the feeding station. 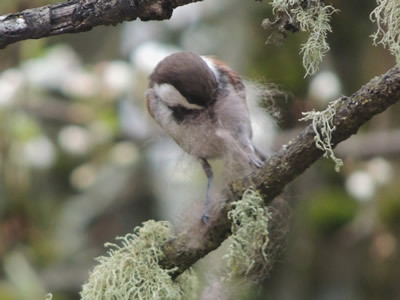 This Chestnut-backed Chickadee really seemed to appreciate its lucky find. This is the time of the great migration across North America. 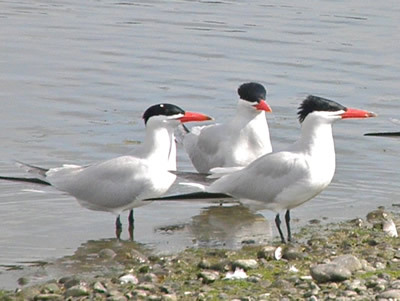 need to protect migratory birds and their habitats. This year it all happens on May 10-11. Biological Diversity. Click here for full details. 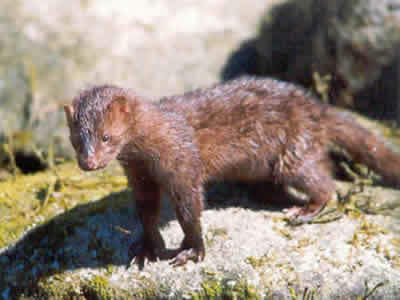 Did you know that the mink hunts on land but is also a very capable swimmer and can dive as deep as 16 ft/4.9 m? 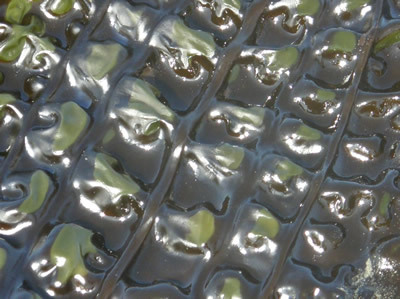 Its long, slender body allows it to hunt underground in burrows. The state of Idaho has an official fruit: the Huckleberry. 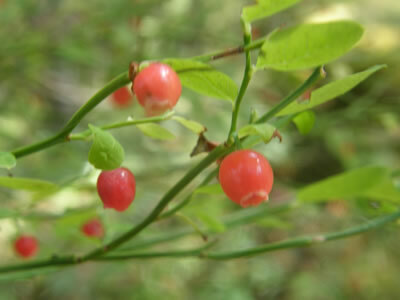 Several Huckleberry species are native to the state. 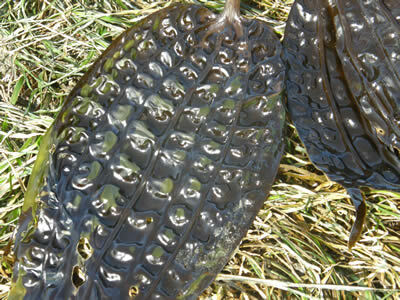 Costaria costata, an interesting looking seaweed. We hope you'll watch for the next issue of Whispers in your inbox in June. See you then!